In what has become San Clemente’s premier social event, Toast to the Casa was an evening to stimulate all the senses, blending fine wine and excellent cuisine with great music and a silent auction. Guests mingled on the 2.4-acre estate enjoying the stunning view as they sampled specialty hors d’oeuvres provided by Antoine’s Café, Avila’s El Ranchito, BeachFire Grill, Blue Danube, Carbonara’s Trattoria Italiana, Café 207, Fisherman’s Restaurant, Gordon James Grill, The Posh Peasant, Schmid’s Fine Chocolate, Sonny’s Pizza & Pasta, Swiss Chalet, Trader Joe’s, Vine and White Horses. The evening also featured tasting of top wines from an array of national distributors. The sounds of music filled every area of the spectacular bluff-top estate. 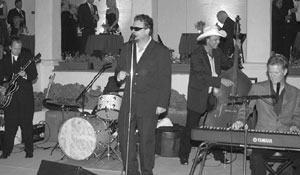 The Ocean Terrace was alive with dancing under the stars to the music of 2000 Pounds of Blues swing band. Gallery I offered folk music by Lu U. & Susie P. to accompany the Casa’s latest exhibition A Journey Shared: Photographs by Horace Bristol, comprised of 37 images taken by Bristol in his travels with John Steinbeck to California’s Central Valley during the Depression Era. (l-r) Patrick and Mimi Griffin, Julianne and Chris North, Joanne and Joh Barron take a pose at the ‘Toast’.Soniquete Flamenco dancers performed in the central courtyard to the cheering approval of the audience, while the Jazz Attack Trio played on the West Terrace and the Main Hall offered contemporary music played by Gerard Hagen on the Casa’s grand piano. “It’s wonderful to see the generations enjoying Casa Romantica and having a great time. We wanted the Casa to be the heart of the San Clemente community for both new and long-time residents, and that’s what’s happened,” enthused Guy Varriano, Board Vice-President and Founding President Emeritus. Those sponsors at the Champagne and Cabernet levels who helped make the Toast to the Casa a successful fundraising event include Talega, San Clemente; Redmond Schwartz Mark Design; Keith and Judy Swayne; Reuben and Mary Lou Casey; DeNault’s Hardware, Homes of the West; Beach Castles Development; and CPD Development Inc.
Sponsors at the Chardonnay level are: Dr. Kent & Laurie Adamson, Dwayne & Faye Berger, Jennifer Blake, Ed & Maggie Chang, Distinctive Coastal Properties, Heil-Brice Retail Advertising, Lanneau Miller, Pacific Coast National Bank, Prudential, Union Bank of California, Universal Press, WLA Investments, and David & Carolyn Westendorf. 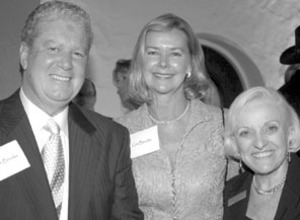 Stan and Gini Brooks with Ruth DeNault enjoying the event.